We keep the tradition of leaded glass lamp making alive. 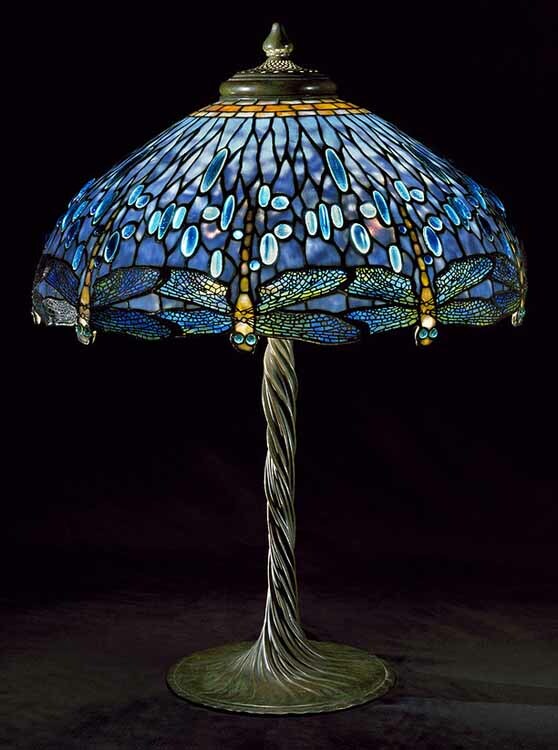 This photo shows an antique 22" Dragonfly lamp made by Tiffany Studios New York. Since 1980, we have been creating extraordinary reproductions of Tiffany lamp designs using the original working methods of Tiffany Studios. The lamps recapture the artistry of the originals through subtle coloration achieved by matching the finest glass available and through meticulous hand-crafting of the metalwork in each shade. We also professionally restore and repair original Tiffany lamps using long-lost methods that only we have rediscovered. We have created lamps for customers worldwide, including architects, interior designers and individuals that appreciate Tiffany Studios work, but who do not wish to pay the incredibly high prices that original antique lamps command. Please visit our Tiffany Lamps gallery to see our range of shades and bases. E-mail us at any time to inquire about completed lamps that are available and for custom lamp orders. We ship worldwide by FedEx, with all glass / bronze items packed professionally in wooden boxes.